Distribution map of Texas wild-rice (Zizania texana). 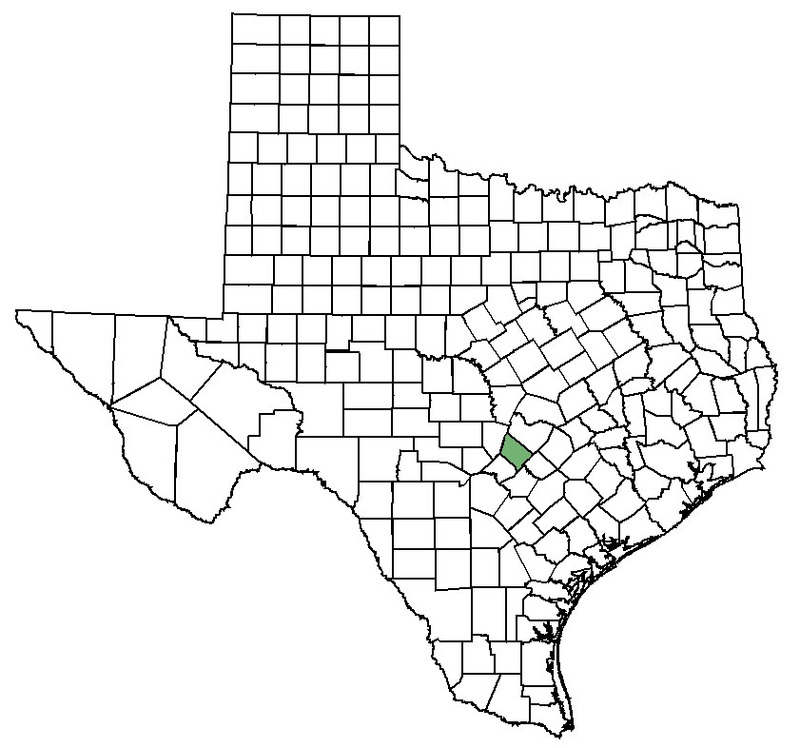 Texas wild-rice is only known from the upper two miles of the San Marcos River in Hays County, Texas. 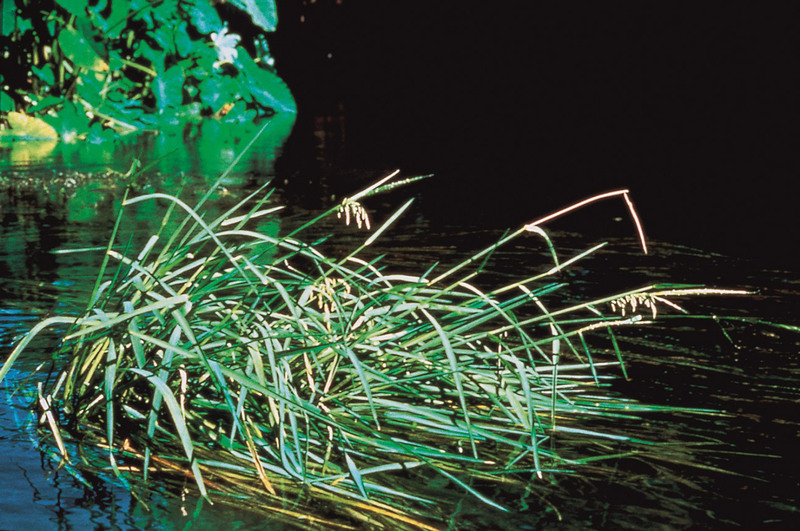 Texas wild-rice is a clumping perennial grass that roots underwater in riverbeds. The 1-2 m long stems bend, flowing parallel to the current, but the upper stem can bend back upward, above the water surface. The linear leaves are narrow (usually 3-25 mm wide), to 200 cm long, and a prominent vein running down the middle of the blade. Male and female flowers occur separately on side branches of a 16-31 cm long flowering stalk. The male flowers dangle off the lower side branches of the flowering stalk, while the female flowers are produced on the stiffly erect upper side branches. As is typical of grasses, flowers are quite small (6.5-12.5 mm long, 1.2-2 mm wide) and inconspicuous. Male flowers bear pollen, are oblong to egg-shaped, and are slightly pointed at both ends. Female flowers produce seed, and the flowers are topped with a very thin, 9-35 mm long bristle. Texas wild-rice seeds are cylindrical, 4.3-7.6 mm long, 1-1.5 mm wide, and either black, brown or greenish. The upper stems of Texas wild-rice can emerge above the water surface. The male and female flowers occur separately on side branches of a flowering stalk. The male flowers dangle lower down the flowering stalk than the rigid female flowers. Texas wild-rice roots underwater, and the stems bend, flowing parallel to the current. The leaves have a prominent main vein running down the middle of the blade. Texas wild-rice flowers are quite small. 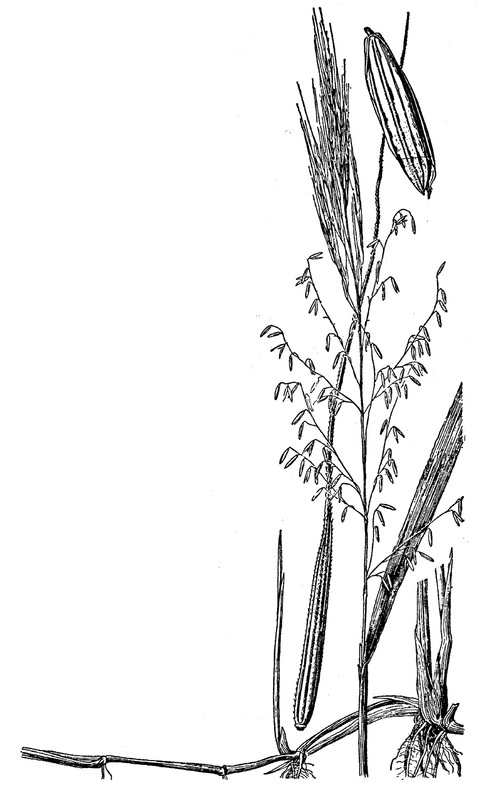 Female flowers are topped with a very thin, long bristle and seeds are cylindrical (shown in the upper right of the illustration overlapping the bristle of the female flower). Credit: USDA-NRCS PLANTS Database / Hitchcock, A.S. (rev. A. Chase). Manual of the grasses of the United States. Stems of giant cutgrass (Zizaniopsis miliacea) usually emerge from the water and grow to 4 m long. The male and female flowers occur on the same branches, with the female flowers closer to the stem’s tip than the male flowers. Eel grass (Vallisneria spiralis) and Illinois pondweed (Potamogeton illinoensis) both occur with Texas wild-rice and appear similar, but neither have the strong vein which runs down the middle of the Texas wild-rice blade. Illinois pondweed can be identified by its oval to tear-drop shaped leaves, as opposed to the longer, linear leaves of Texas wild-rice. The male and female flowers of giant cutgrass occur on the same side branches of the flowering stalk. Giant cutgrass roots in shallow waters of wetlands, but generally holds its leaves above the water surface. Texas wild-rice grows in gravelly or coarse sandy soils in clear, cool, fast-flowing waters of spring-fed rivers. 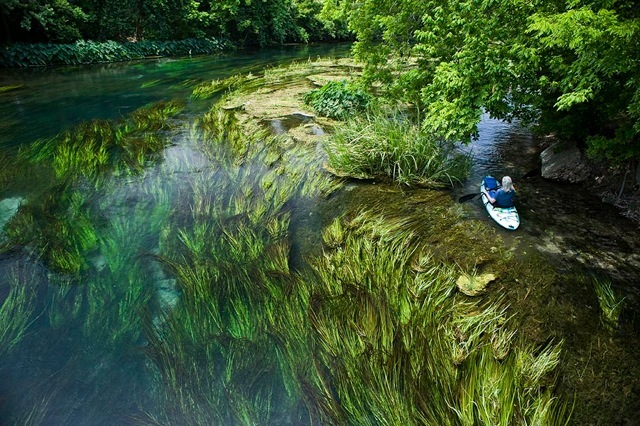 Credit: Wyatt McSpadden - Courtesy of the Edwards Aquifer Authority. Flowering occurs from spring to summer, but flowering has been observed throughout the year. Texas wild-rice can be identified year-round. Rare in both extent and distribution, Texas wild-rice is threatened by the factors associated with its urban location near the headwaters of the San Marcos River. Texas wild-rice must live with continual habitat alteration, non-native species introductions, pollution, and recreational impacts. Although it has been shown that the areal coverage of the Texas wild-rice populations has increased over the last 35 years, the population has simultaneously decreased in overall range. Poole, J.M. 2002. Map historical distribution of Texas wildrice (Zizania texana) 1989 to 1999. Section 6 final report. Austin: Texas Parks & Wildlife Department. Poole, J.M. and D.E. Bowles. 1999. Habitat characterization of Texas wild-rice (Zizania texana Hitchcock), an endangered aquatic macrophyte from the San Marcos River. Aquatic Conservation. 9: 291-302. Poole, J.M. and G.K. Janssen. 1997. Managing and monitoring rare and endangered plants on highway right-of-ways in Texas. Section 6 final report. Austin: Texas Parks & Wildlife Department. Power, P. 2001. Continued maintenance, reintroduction and research on Texas wildrice (Zizania texana). Section 6 final report. Austin: Texas Parks & Wildlife Department.